The other week I fleetingly wondered about the notion of spring cleaning. Do any of us really do that any more or is it something that went out of the window decades ago ? It would appear that the concept of spring cleaning is connected to the cold and long dark days of winter being over and the dirt created by constant fires to keep the home warm and oil lamps for light: The idea that every grain of soot and grease be banished from our homes. So the place to start would be some home management books from the 19th and early 20th century, right ? That doyenne of British domesticity, Isabella Beeton, drew an absolute blank in her Book of Home Management. Nor did H C Davidsons 1905 four volume Book of the Home extravanga reveal anything either. Trawling through later books it wasn&apos;t until the post war Good Housekeeping Home Encyclopaedia was there the merest hint of it. Then it began to dawn on me. The upper class and middle class families had servants: Fleets of them. They wouldn&apos;t need to spring clean as the house would be spick and span every day. It would only be the working families who would need cast aside everything in the house and clean from top to toe to be rid of an entire winter&apos;s soot and grime. Social history researchers have actually traced the origin of spring cleaning to the Iranian Nowruz, the Persian new year, which falls on the first day of spring. Iranians continue the practice of khooneh tekouni, which literally means shaking the house, just before the new year.﻿ Equally, in Jewish custom the house was thoroughly cleaned in order to celebrate Passover. But back to Good Housekeeping who recommend that you do a room a week as it is less tiring and disruptive to the rest of the family. They helpfully suggest a list of things to do in advance preparation such as arranging decorating, examining furniture for repairs, sweeping chimneys and checking that all cleaning equipment is in good working order - also suggesting that if you don&apos;t own a vacuum cleaner then one should be hired. Blankets, covers and curtains to be washed and cleaned, and cupboards turned out. No wonder they suggest one room a week. Usefully there is a 15 step plan for rooms starting and ending with the curtains. I need a rest just reading it ! Which brings me back to my original inspiration: The myriad of brushes needed for spring cleaning. 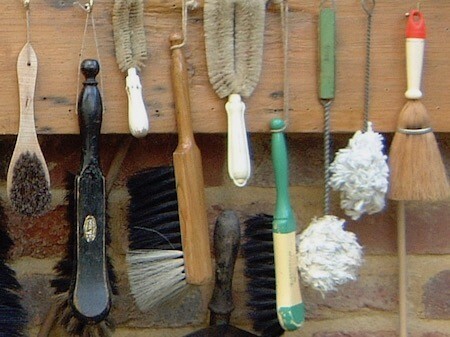 Did people really have quite so many contorted brushes to clean every nook and cranny of their houses ? Looking at our Brushes page, there is a three pronged affair for cleaning both sides of Venetian blinds, a dinky straw brush for the sink and one with a long handle for the hearth. Upholstery brushes were curved loops of hard bristles that would go round the curves of chairs and down the sides - which I&apos;m ashamed to say I thought were loo brushes until sternly corrected by a colleague. Even the soft hand brush with its turned handle was modified for cleaning the ﻿bannisters. 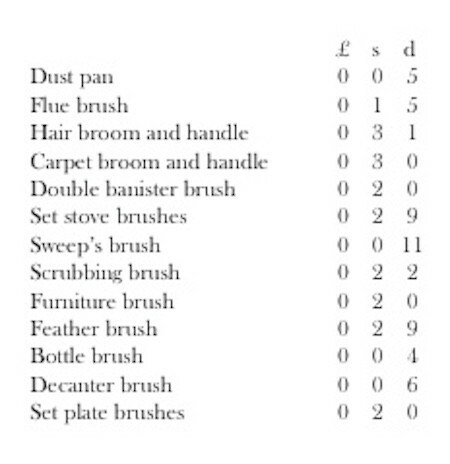 Then there were carpet brushes, scrubbing brushes, range brushes, decanter and bottle brushes. I&apos;m guessing that the popularity of vacuum cleaners and more women entering the workforce was responsible for the reduction in cleaning and the need for brushes. Yet sometimes - just sometimes - it would be nice to toss the bagless, cordless vacuum aside and return to the simplicity of a little brush. Your comment has been sent successfully. Thanks for your comment! The parkin looks deliciously gooey. I can't wait to make it !